According to the history books Cnut the Great became King of England in 1016 AD. Cnut the Great (c. 995 – 1035), also known as Canute – whose father was Sweyn Forkbeard (which gave him the patronym Sweynsson, Old Norse: Sveinsson) – was King of Denmark, England and Norway; together often referred to as the North Sea Empire. Cnut the Great is famously remembered for knowing he had no control over the elements. In the story, Canute demonstrates to his flattering courtiers that he has no control over the elements (the incoming tide), explaining that secular power is vain compared to the supreme power of God. Nowadays, the Great Cnuts of Climate believe humans influence the elements. The largest human influence has been the emission of greenhouse gases such as carbon dioxide, methane and nitrous oxide. Furthermore, the Great Cnuts of Climate believe they can control the elements. Climate change mitigation consists of actions to limit the magnitude or rate of long-term climate change. Mitigation policies can substantially reduce the risks associated with human-induced global warming. The ultimate objective of the UNFCCC is to stabilize atmospheric concentrations of GHGs at a level that would prevent dangerous human interference of the climate system. 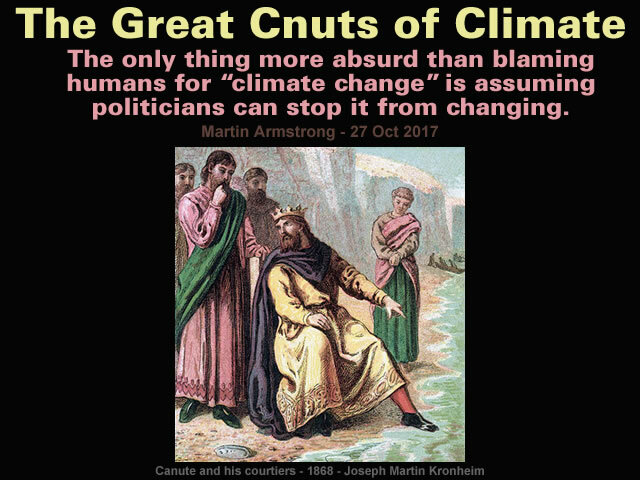 Unfortunately, the Great Cnuts of Climate have emerged from the same fetid swamp of experts, corporations, lobby groups, NGOs and politicians that have unleashed such stunningly lucrative failures as the War on Drugs and the Global War on Terrorism. The War on Drugs is an American term usually applied to the United States government’s campaign of prohibition of drugs, military aid, and military intervention, with the stated aim being to reduce the illegal drug trade. This initiative includes a set of drug policies that are intended to discourage the production, distribution, and consumption of psychoactive drugs that the participating governments and the UN have made illegal. The War on Terror (WoT), also known as the Global War on Terrorism (GWOT), is a metaphor of war referring to the international military campaign that was launched by the U.S. government after the September 11 attacks in the U.S. in 2001. Clearly, it’s totally absurd to believe any good can come from letting these creatures from the fetid swamp launch [at the taxpayers expense] a Global War on Climate Change. The only thing more absurd than blaming humans for “climate change” is assuming politicians can stop it from changing. Do You Really Think Politicians Can Stop Climate Change? Personally, I have more faith in Clark Stanley’s Snake Oil Liniment than the creatures from the fetid swamp. I was born in Abilene, Taylor County, Texas, and at the age of fourteen I took my first trip up the trail and followed the life of a Cow-boy for eleven years. 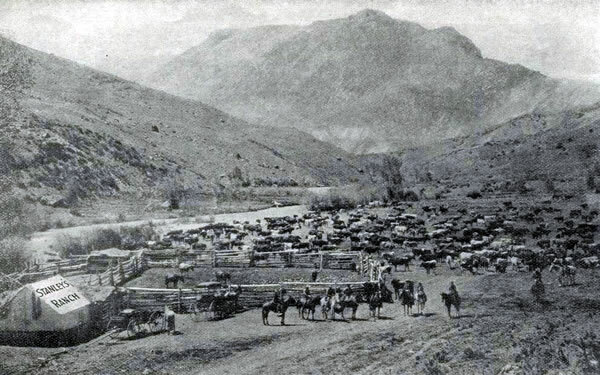 After the “ round-up ” in the Spring of 1879 I started with some of my father’s best friends to the Moki, Pueblos at Wolpi, Arizona, to witness the snake dance which takes place once in two years ; there I became acquainted with the medicine man of the Moki tribe, and as he liked the looks of my Colt’s revolver and asked me to show him how it would shoot, I gave him an exhibition of my fancy shooting, which pleased him very much ; he then asked me how I would like to stay there and live with him, I told him I would stay until after the snake dance. After my friends and I witnessed the snake dance, they returned to Texas, and I was so much pleased with the dance I decided to remain with them and see the dance again. I lived with the Moki tribe two years and five months, and during that time I learned their language and dances and the secret of making their medicines. The medicine that interested me most, was their Snake Oil Medicine as they call it. It is used for rheumatism, contracted cords and all aches and pains. As I was thought a great deal of by the medicine man he gave me the secret of making the Snake Oil Medicine, which is now named Clark Stanley’s Snake Oil Liniment. Snake Oil is not a new discovery, it has been in use by the Moki’s and other Indian tribes for many generations, and I have made an improvement on the original formula. Gallery | This entry was posted in Atmospheric Science, Books, History, Inventions and Deceptions. Bookmark the permalink. Snake oil is not as fraudulent as many people believe. The real stuff has a long history in Chinese traditional medicine, and has been found to be a potent source of omega 3 fatty acids, which inhibit inflammation. Of course, the stuff being peddled by Mr Stanley was probably not the real thing, and therefore worthless. The caduceus is the staff carried by Hermes in Greek mythology and consequently by Hermes Trismegistus in Greco-Egyptian mythology. The same staff was also borne by heralds in general, for example by Iris, the messenger of Hera. It is a short staff entwined by two serpents, sometimes surmounted by wings. In Roman iconography, it was often depicted being carried in the left hand of Mercury, the messenger of the gods, guide of the dead and protector of merchants, shepherds, gamblers, liars, and thieves. Some accounts suggest that the oldest known imagery of the caduceus have their roots in a Mesopotamian origin with the Sumerian god Ningishzida whose symbol, a staff with two snakes intertwined around it, dates back to 4000 B.C. to 3000 B.C. So is Clark Stanley – but for all the wrong reasons. With the help of a Boston druggist he began marketing his product at Western medicine shows. In 1893 he and his rattlesnakes became a hit attraction at the World’s Columbian Exposition in Chicago, Illinois. His act included the killing of rattlesnakes and squeezing their bodies, and what came out he labeled snake oil. Later he went on to establish production facilities in Beverly, Massachusetts and Providence, Rhode Island. In 1916, subsequent to the passage of the Pure Food and Drug Act in 1906, Stanley’s concoction was examined and found to be of no value (it was mostly mineral oil). He was fined $20.00 (corresponds to $443 in 2017). Stanley’s snake oil – produced by Clark Stanley, the “Rattlesnake King” – was tested by the United States government in 1917. It was found to contain: mineral oil, 1% fatty oil (presumed to be beef fat), red pepper, turpentine, camphor. This is similar in composition to modern-day capsaicin-based liniments or chest rubs. None of the oil content was found to have been extracted from actual snakes. Another one in the eye for the tedious prophets of man-made climate doom. The idea that politicians could somehow control the climate is just a first step. The notion is to get the public conditioned to the idea that climate is controllable, not that politicians per se can do it. Once you have the the notion firmly ensconced in everyone’s’ mind it is but a short step for full agreement on global geo-engineering the weather and climate. How simple and utterly deniable it would be for the politicians. For example if a little mishap in a geo-engineering project were to cause droughts, floods and extremes of hot or cold weather. Who could honestly say which part of the mishap is man-made and which natural. How utterly useful to the elites at the UN with their perverse ideas of population control. Harvard and other universities have similar programs well underway.